Ref: Saint Birgitta. Revelationes. Nuremberg: Printed by Anton Koberger, 1500. Sir George Grey Special Collections. Revelationes was printed in 1500 in Nuremberg. Auckland Libraries' copy was a donation from Sir George Grey. Iain Sharp in Real Gold describes Revelationes as 'a blend of theological meditation, biblical lore and spiritual autobiography'. Revelationes was dictated to the confessors of Saint Birgitta, a Swedish mystic, over a period of twenty years. 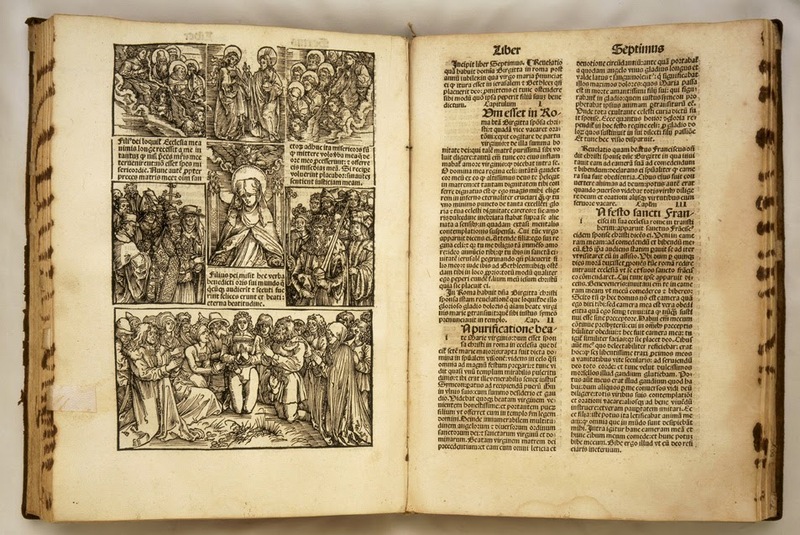 It is generally accepted that Albrecht Dürer designed the woodcuts, even if someone else did the physical cutting of the blocks. Venice: Franciscus Renner and Nicolaus de Frankfordia, 1476. 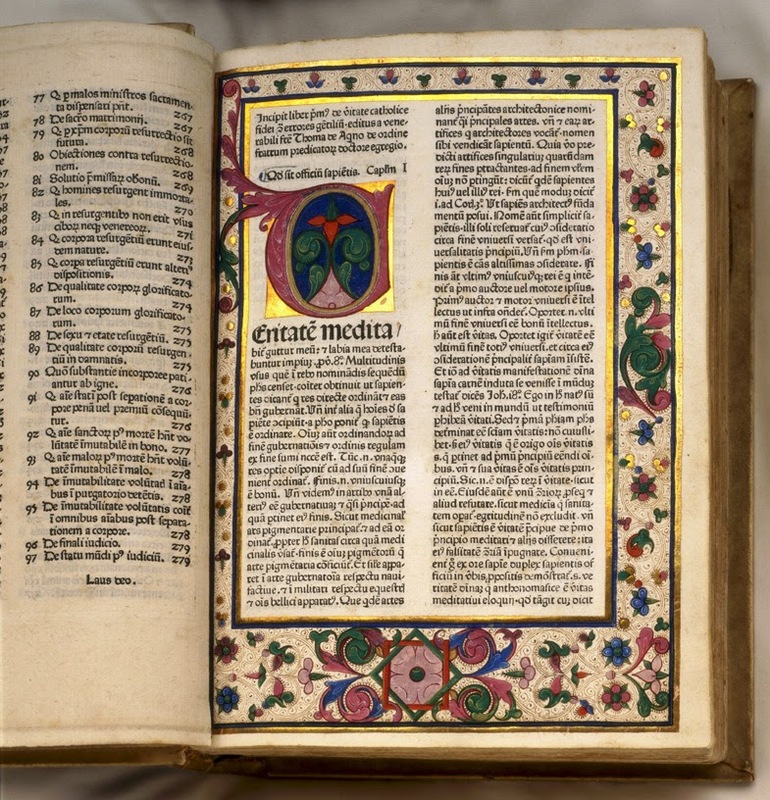 The 1476 edition of Summa contra Gentiles has a similar aesthetic to medieval manuscripts. The gothic type, illuminated borders and ornamental initials are all characteristic of handwritten texts from earlier decades. Auckland Libraries' excellent copy was donated by Henry Shaw. Ref: Speculum humanae salvationis, Ausberg: Printed by Gunther Zainer, 1473. The Speculum humanae salvationis first appeared in Europe in the 1320s and was aimed at ordinary religious people with limited education. Included, in this edition from 1473, are 192 woodcuts, hand-coloured after printing, which were crucial in communicating the book's messages. The illustration on the left, above, depicts the biblical scene of Adam and Eve eating the forbidden fruit of the Tree of Knowledge. 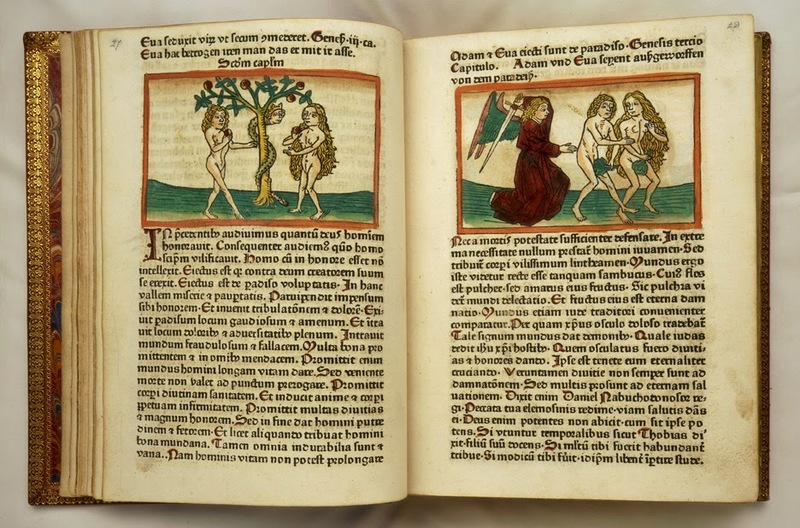 The 1473 edition of Speculum humanae salvationis is one of only twenty-five complete specimens known to exist. In 2011, the Auckland Library Heritage Trust and the ASB Community Trust provided grants to support a project which involved the cataloguing of printed material published pre-1800 -- including the incunabula -- in Sir George Grey Special Collections. The catalogue records are very in-depth and provide great access to Auckland Libraries' rare book collection. Author: Zoë Colling, Sir George Grey Special Collections. With information from Real Gold by Iain Sharp.